Honk is here again! The seventh collection of activist street bands has been the best so far (despite some light rain last evening). Yesterday I had a blast wandering around Davis Square with my buddy Will, both of us with our little digital recorders vacuuming up audio all over. The whole thing (but especially the high tech field recording aspect) reminded me of a new record I recently rescued from the trash. In the now familiar sequence, a friend was getting rid of the last mildewy pile of old LPs and I was the last to look at them before they hit the trash. Mostly light 70s and 80’s rock and random things like the Flashdance soundtrack. Ahhhh, but what’s this?!?! Folkways Music of the South Vol. 10 Been Here and Gone. “Oooh…I’ll take this one! Thanks!” People seemed slightly perplexed as they watched all the popular (and perhaps their favorite) records banished to the trash while only this oddity was rescued. One man’s trash…as they say…and what a treasure it is! This album originally came out in 1960 as an audio companion to a book of the same name. 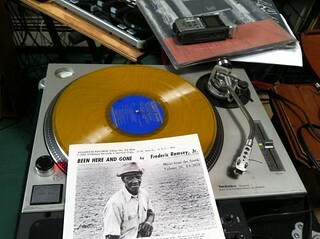 The tracks on this volume are selected from recordings made by Frederic Ramsey between 1951 and 1957. It is essentially a greatest hits compilation of the Folkways series “Music of the South” which began in 1955. The PDF of the liner notes are available free from the nice people at the Smithsonian if you want more details (and beautiful pictures as well). The piece I wanted to share is the wonderful street recording of the Eureka Brass Band in New Orleans. In addition to the amazing performance that really heats up toward the end, I love the ambient crowd sound and the little discussion you hear between a man and a woman you hear throughout (listen for her mention of “Rock and Roll”!). If the content wasn’t good enough, its also on YELLOW VINYL! I have fresh batteries in my recorder and am off to Day 2 in Harvard Square! This entry was posted in Uncategorized by pace. Bookmark the permalink.